This article is about the history of the concept. For a history of the period, see Early Middle Ages. For other uses, see Dark Ages (disambiguation). The "Dark Ages" is a historical periodization traditionally referring to the Middle Ages, that asserts that a demographic, cultural, and economic deterioration occurred in Western Europe following the decline of the Roman Empire. The term employs traditional light-versus-darkness imagery to contrast the era's "darkness" (lack of records) with earlier and later periods of "light" (abundance of records). The concept of a "Dark Age" originated in the 1330s with the Italian scholar Petrarch, who regarded the post-Roman centuries as "dark" compared to the light of classical antiquity. The phrase "Dark Age" itself derives from the Latin saeculum obscurum, originally applied by Caesar Baronius in 1602 to a tumultuous period in the 10th and 11th centuries. The concept thus came to characterize the entire Middle Ages as a time of intellectual darkness between the fall of Rome and the Renaissance; this became especially popular during the 18th-century Age of Enlightenment. As the accomplishments of the era came to be better understood in the 18th and 20th centuries, scholars began restricting the "Dark Ages" appellation to the Early Middle Ages (c. 5th–10th century), and now scholars also reject its usage in this period. The majority of modern scholars avoid the term altogether due to its negative connotations, finding it misleading and inaccurate. The original definition remains in popular use, and popular culture often employs it as a vehicle to depict the Middle Ages as a time of backwardness, extending its pejorative use and expanding its scope. The idea of a Dark Age originated with the Tuscan scholar Petrarch in the 1330s. Writing of the past, he said: "Amidst the errors there shone forth men of genius; no less keen were their eyes, although they were surrounded by darkness and dense gloom". Christian writers, including Petrarch himself, had long used traditional metaphors of 'light versus darkness' to describe 'good versus evil'. Petrarch was the first to give the metaphor secular meaning by reversing its application. He now saw Classical Antiquity, so long considered a 'dark' age for its lack of Christianity, in the 'light' of its cultural achievements, while Petrarch's own time, allegedly lacking such cultural achievements, was seen as the age of darkness. From his perspective on the Italian peninsula, Petrarch saw the Roman and classical period as an expression of greatness. He spent much of his time travelling through Europe, rediscovering and republishing classic Latin and Greek texts. He wanted to restore the Latin language to its former purity. Renaissance humanists saw the preceding 900 years as a time of stagnation, with history unfolding not along the religious outline of Saint Augustine's Six Ages of the World, but in cultural (or secular) terms through progressive development of classical ideals, literature, and art. Petrarch wrote that history had two periods: the classic period of Greeks and Romans, followed by a time of darkness in which he saw himself living. In around 1343, in the conclusion of his epic Africa, he wrote: "My fate is to live among varied and confusing storms. But for you perhaps, if as I hope and wish you will live long after me, there will follow a better age. This sleep of forgetfulness will not last forever. When the darkness has been dispersed, our descendants can come again in the former pure radiance." In the 15th century, historians Leonardo Bruni and Flavio Biondo developed a three-tier outline of history. They used Petrarch's two ages, plus a modern, 'better age', which they believed the world had entered. Later the term 'Middle Ages' - Latin media tempestas (1469) or medium aevum (1604) - was used to describe the period of supposed decline. During the Reformations of the 16th and 17th centuries, Protestants generally had a similar view to Renaissance Humanists such as Petrarch, but also added an Anti-Catholic perspective. They saw classical antiquity as a golden time, not only because of its Latin literature, but also because it witnessed the beginnings of Christianity. They promoted the idea that the 'Middle Age' was a time of darkness also because of corruption within the Roman Catholic Church, such as: Popes ruling as kings, veneration of saints' relics, a licentious priesthood, and institutionalized moral hypocrisy. "The new age (saeculum) which was beginning, for its harshness and barrenness of good could well be called iron, for its baseness and abounding evil leaden, and moreover for its lack of writers (inopia scriptorum) dark (obscurum)". Significantly, Baronius termed the age 'dark' because of the paucity of written records. The "lack of writers" he referred to may be illustrated by comparing the number of volumes in Migne's Patrologia Latina containing the work of Latin writers from the 10th century (the heart of the age he called 'dark') with the number containing the work of writers from the preceding and succeeding centuries. A minority of these writers were historians. Medieval production of manuscripts. The beginning of the Middle Ages was also a period of low activity in copying. Note that this graph does not include the Byzantine Empire. There is a sharp drop from 34 volumes in the 9th century to just 8 in the 10th. The 11th century, with 13, evidences a certain recovery, and the 12th century, with 40, surpasses the 9th, something the 13th, with just 26, fails to do. There was indeed a 'dark age', in Baronius's sense of a "lack of writers", between the Carolingian Renaissance in the 9th century and the beginnings, some time in the 11th, of what has been called the Renaissance of the 12th century. 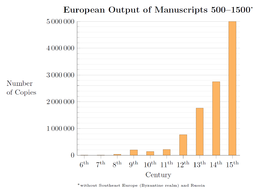 Furthermore, there was an earlier period of "lack of writers" during the 7th and 8th centuries. So, in Western Europe, two 'dark ages' can be identified, separated by the brilliant but brief Carolingian Renaissance. Baronius's 'dark age' seems to have struck historians, for it was in the 17th century that the term started to proliferate in various European languages, with his original Latin term saeculum obscurum being reserved for the period he had applied it to. But while some, following Baronius, used 'dark age' neutrally to refer to a dearth of written records, others used it pejoratively, lapsing into that lack of objectivity that has discredited the term for many modern historians. The first British historian to use the term was most likely Gilbert Burnet, in the form 'darker ages' which appears several times in his work during the later 17th century. The earliest reference seems to be in the "Epistle Dedicatory" to Volume I of The History of the Reformation of the Church of England of 1679, where he writes: "The design of the reformation was to restore Christianity to what it was at first, and to purge it of those corruptions, with which it was overrun in the later and darker ages." He uses it again in the 1682 Volume II, where he dismisses the story of "St George's fighting with the dragon" as "a legend formed in the darker ages to support the humour of chivalry". Burnet was a bishop chronicling how England became Protestant, and his use of the term is invariably pejorative. During the Age of Enlightenment of the 17th and 18th centuries, many critical thinkers saw religion as antithetical to reason. For them the Middle Ages, or "Age of Faith", was therefore the opposite of the Age of Reason. Kant and Voltaire were vocal in attacking the Middle Ages as a period of social regress dominated by religion, while Gibbon in The History of the Decline and Fall of the Roman Empire expressed contempt for the "rubbish of the Dark Ages". Yet just as Petrarch, seeing himself at the cusp of a "new age", was criticising the centuries before his own time, so too were Enlightenment writers. Consequently, an evolution had occurred in at least three ways. Petrarch's original metaphor of light versus dark has expanded over time, implicitly at least. Even if later humanists no longer saw themselves living in a dark age, their times were still not light enough for 18th-century writers who saw themselves as living in the real Age of Enlightenment, while the period to be condemned stretched to include what we now call Early Modern times. Additionally, Petrarch's metaphor of darkness, which he used mainly to deplore what he saw as a lack of secular achievement, was sharpened to take on a more explicitly anti-religious and anti-clerical meaning. 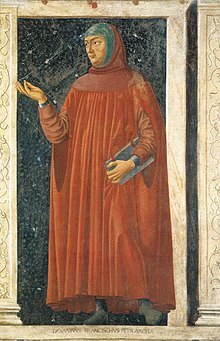 Nevertheless, the term 'Middle Ages', used by Biondo and other early humanists after Petrarch, was in general use before the 18th century to denote the period before the Renaissance. The earliest recorded use of the English word "medieval" was in 1827. The concept of the Dark Ages was also in use, but by the 18th century it tended to be confined to the earlier part of this period. The earliest entry for a capitalized "Dark Ages" in the Oxford English Dictionary is a reference in Henry Thomas Buckle's History of Civilization in England in 1857. Starting and ending dates varied: the Dark Ages were considered by some to start in 410, by others in 476 when there was no longer an emperor in Rome, and to end about 800, at the time of the Carolingian Renaissance under Charlemagne, or alternatively to extend through to the end of the 1st millennium. In the late 18th and early 19th centuries, the Romantics reversed the negative assessment of Enlightenment critics with a vogue for medievalism. The word "Gothic" had been a term of opprobrium akin to "Vandal" until a few self-confident mid-18th-century English "Goths" like Horace Walpole initiated the Gothic Revival in the arts. This stimulated interest in the Middle Ages, which for the following generation began to take on the idyllic image of an "Age of Faith". This, reacting to a world dominated by Enlightenment rationalism, expressed a romantic view of a Golden Age of chivalry. The Middle Ages were seen with nostalgia as a period of social and environmental harmony and spiritual inspiration, in contrast to the excesses of the French Revolution and, most of all, to the environmental and social upheavals and utilitarianism of the developing Industrial Revolution. The Romantics' view is still represented in modern-day fairs and festivals celebrating the period with 'merrie' costumes and events. Just as Petrarch had twisted the meaning of light versus darkness, so the Romantics had twisted the judgment of the Enlightenment. However, the period they idealized was largely the High Middle Ages, extending into Early Modern times. In one respect, this negated the religious aspect of Petrarch's judgment, since these later centuries were those when the power and prestige of the Church were at their height. To many, the scope of the Dark Ages was becoming divorced from this period, denoting mainly the centuries immediately following the fall of Rome. The term was widely used by 19th-century historians. In 1860, in The Civilization of the Renaissance in Italy, Jacob Burckhardt delineated the contrast between the medieval 'dark ages' and the more enlightened Renaissance, which had revived the cultural and intellectual achievements of antiquity. However, the early 20th century saw a radical re-evaluation of the Middle Ages, which called into question the terminology of darkness, or at least its more pejorative use. The historian Denys Hay spoke ironically of "the lively centuries which we call dark". More forcefully, a book about the history of German literature published in 2007 describes "the dark ages" as "a popular if ignorant manner of speaking". Most modern historians do not use the term "dark ages", preferring terms such as Early Middle Ages. But when used by some historians today, the term "Dark Ages" is meant to describe the economic, political, and cultural problems of the era. For others, the term Dark Ages is intended to be neutral, expressing the idea that the events of the period seem 'dark' to us because of the paucity of the historical record. The term is used in this sense (often in the singular) to reference the Bronze Age collapse and the subsequent Greek Dark Ages, the dark ages of Cambodia (c. 1450-1863), and also a hypothetical Digital Dark Age which would ensue if the electronic documents produced in the current period were to become unreadable at some point in the future. Some Byzantinists have used the term "Byzantine Dark Ages" to refer to the period from the earliest Muslim conquests to about 800, because there are no extant historical texts in Greek from this period, and thus the history of the Byzantine Empire and its territories that were conquered by the Muslims is poorly understood and must be reconstructed from other contemporaneous sources, such as religious texts. The term "dark age" is not restricted to the discipline of history. Since the archaeological evidence for some periods is abundant and for others scanty, there are also archaeological dark ages. Since the Late Middle Ages significantly overlap with the Renaissance, the term 'Dark Ages' has become restricted to distinct times and places in medieval Europe. Thus the 5th and 6th centuries in Britain, at the height of the Saxon invasions, have been called "the darkest of the Dark Ages", in view of the societal collapse of the period and the consequent lack of historical records. Further south and east, the same was true in the formerly Roman province of Dacia, where history after the Roman withdrawal went unrecorded for centuries as Slavs, Avars, Bulgars, and others struggled for supremacy in the Danube basin, and events there are still disputed. However, at this time the Arab Empire is often considered to have experienced its Golden Age rather than Dark Age; consequently, usage of the term must also specify a geography. While Petrarch's concept of a Dark Age corresponded to a mostly Christian period following pre-Christian Rome, today the term mainly applies to the cultures and periods in Europe that were least Christianized, and thus most sparsely covered by chronicles and other contemporary sources, at the time mostly written by Catholic clergy. However, from the later 20th century onwards, other historians became critical even of this nonjudgmental use of the term, for two main reasons. Firstly, it is questionable whether it is ever possible to use the term in a neutral way: scholars may intend this, but ordinary readers may not understand it so. Secondly, 20th-century scholarship had increased understanding of the history and culture of the period, to such an extent that it is no longer really 'dark' to us. To avoid the value judgment implied by the expression, many historians now avoid it altogether. Science historian David C. Lindberg criticised the public use of 'dark ages' to describe the entire Middle Ages as "a time of ignorance, barbarism and superstition" for which "blame is most often laid at the feet of the Christian church, which is alleged to have placed religious authority over personal experience and rational activity". Historian of science Edward Grant writes that "If revolutionary rational thoughts were expressed in the Age of Reason, they were made possible because of the long medieval tradition that established the use of reason as one of the most important of human activities". Furthermore, Lindberg says that, contrary to common belief, "the late medieval scholar rarely experienced the coercive power of the church and would have regarded himself as free (particularly in the natural sciences) to follow reason and observation wherever they led". Because of the collapse of the Western Roman Empire due to the Migration Period a lot of classical Greek texts were lost there, but part of these texts survived and they were studied widely in the Byzantine Empire and the Abbasid Caliphate. Around the eleventh and twelfth centuries in the High Middle Ages stronger monarchies emerged; borders were restored after the invasions of Vikings and Magyars; technological developments and agricultural innovations were made which increased the food supply and population. And the rejuvenation of science and scholarship in the West was due in large part to the new availability of Latin translations of Aristotle. 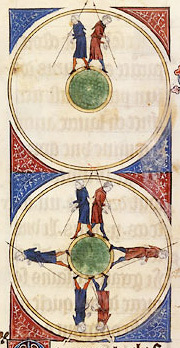 Another view of the period is reflected by more specific notions such as the 19th-century claim that everyone in the Middle Ages thought the world was flat. In fact, lecturers in medieval universities commonly advanced the idea that the Earth was a sphere. Lindberg and Ronald Numbers write: "There was scarcely a Christian scholar of the Middle Ages who did not acknowledge [Earth's] sphericity and even know its approximate circumference". Other misconceptions such as: "the Church prohibited autopsies and dissections during the Middle Ages", "the rise of Christianity killed off ancient science", and "the medieval Christian church suppressed the growth of natural philosophy", are cited by Numbers as examples of myths that still pass as historical truth, although unsupported by current research. ^ a b c d Oxford English Dictionary (2 ed.). Oxford, England: Oxford University Press. 1989. a term sometimes applied to the period of the Middle Ages to mark the intellectual darkness characteristic of the time; often restricted to the early period of the Middle Ages, between the time of the fall of Rome and the appearance of vernacular written documents. ^ a b "Definition of DARK AGE". www.merriam-webster.com. ^ a b c Mommsen, Theodore E. (1942). "Petrarch's Conception of the 'Dark Ages'". Speculum. Cambridge MA: Medieval Academy of America. 17 (2): 227–228. doi:10.2307/2856364. JSTOR 2856364. ^ Thompson, Bard (1996). Humanists and Reformers: A History of the Renaissance and Reformation. Grand Rapids, MI: Erdmans. p. 13. ISBN 978-0-8028-6348-5. Petrarch was the very first to speak of the Middle Ages as a 'dark age', one that separated him from the riches and pleasures of classical antiquity and that broke the connection between his own age and the civilization of the Greeks and the Romans. ^ Dwyer, John C., Church history: twenty centuries of Catholic Christianity, (1998) p. 155. ^ Mommsen, Theodore E. "Petrarch's conception of the'Dark Ages'." Speculum 17.2 (1942): 226-242. ^ Ker, W. P. (1904). The dark ages. New York: C. Scribner's Sons, p. 1. "The Dark Ages and the Middle Ages — or the Middle Age — used to be the same; two names for the same period. But they have come to be distinguished, and the Dark Ages are now no more than the first part of the Middle Age, while the term mediaeval is often restricted to the later centuries, about 1100 to 1500, the age of chivalry, the time between the first Crusade and the Renaissance. This was not the old view, and it does not agree with the proper meaning of the name." ^ Syed Ziaur Rahman, Were the "Dark Ages" Really Dark? In: Grey Matter. The Co-curricular Journal of Jawaharlal Nehru Medical College, Aligarh Muslim University, Aligarh, 2003: 7-10. ^ Fouracre, Paul (eds). The New Cambridge Medieval History: Volume 1 c.500–c.700. Cambridge University Press, 2005, 90. "In terms of the sources of information available, this is most certainly not a Dark Age... Over the last century, the sources of evidence have increased dramatically, and the remit of the historian (broadly defined as a student of the past) has expanded correspondingly." ^ Snyder, Christopher A. (1998). An Age of Tyrants: Britain and the Britons A.D. 400–600. University Park: Pennsylvania State University Press. pp. xiii–xiv. ISBN 0-271-01780-5. . In explaining his approach to writing the work, Snyder refers to the "so-called Dark Ages", noting that "Historians and archaeologists have never liked the label Dark Ages ... there are numerous indicators that these centuries were neither 'dark' nor 'barbarous' in comparison with other eras." ^ a b c d e Jordan, Chester William (2004). Dictionary of the Middle Ages, Supplement 1. Verdun, Kathleen, "Medievalism" pp. 389–397. Sections 'Victorian Medievalism', 'Nineteenth-Century Europe', 'Medievalism in America 1500–1900', 'The 20th Century'. Same volume, Freedman, Paul, "Medieval Studies", pp. 383–389. ^ Raico, Ralph. "The European Miracle". Retrieved 14 August 2011. "The stereotype of the Middle Ages as 'the Dark Ages' fostered by Renaissance humanists and Enlightenment philosophes has, of course, long since been abandoned by scholars." ^ a b Franklin, James (1982). "The Renaissance Myth". Quadrant. 26 (11): 51–60. ^ Tainter, Joseph A. (1999). "Post Collapse Societies". In Barker, Graeme (ed.). Companion Encyclopedia of Archaeology. Abingdon, England: Routledge. p. 988. ISBN 0-415-06448-1. ^ * Nelson, Janet (Spring 2007). "The Dark Ages". History Workshop Journal. 63: 196–98. ISSN 1477-4569. ^ a b c d Mommsen, Theodore E. (1942). "Petrarch's Conception of the 'Dark Ages'". Speculum. Cambridge MA: Medieval Academy of America. 17 (2): 226–242. doi:10.2307/2856364. JSTOR 2856364. ^ Petrarch (1367). Apologia cuiusdam anonymi Galli calumnias (Defence against the calumnies of an anonymous Frenchman), in Petrarch, Opera Omnia, Basel, 1554, p. 1195. This quotation comes from the English translation of Mommsen's article, where the source is given in a footnote. Cf. also Marsh, D, ed., (2003), Invectives, Harvard University Press, p. 457. ^ Petrarch (1343). Africa, IX, 451-7. This quotation comes from the English translation of Mommsen's article. ^ Albrow, Martin, The global age: state and society beyond modernity (1997), p. 205. ^ F. Oakley, The medieval experience: foundations of Western cultural singularity (University of Toronto Press, 1988), pp. 1-4. ^ Daileader, Philip (2001). The High Middle Ages. The Teaching Company. ISBN 1-56585-827-1. "Catholics living during the Protestant Reformation were not going to take this assault lying down. They, too, turned to the study of the Middle Ages, going back to prove that, far from being a period of religious corruption, the Middle Ages were superior to the era of the Protestant Reformation, because the Middle Ages were free of the religious schisms and religious wars that were plaguing the 16th and 17th centuries." Shotwell, James Thomson (1911). "History" . In Chisholm, Hugh (ed.). Encyclopædia Britannica. 13} (11th ed.). Cambridge University Press. p. 530. ^ Lord Acton (1906). Lectures on Modern History, p. 121. ^ Baronius's actual starting-point for the "dark age" was 900 (annus Redemptoris nongentesimus), but that was an arbitrary rounding off due mainly to his strictly annalistic approach. Later historians, e.g. Marco Porri in his Catholic History of the Church (Storia della Chiesa) or the Lutheran Christian Cyclopedia ("Saeculum Obscurum"), have tended to amend it to the more historically significant date of 888, often rounding it down further to 880. The first weeks of 888 witnessed both the final break-up of the Carolingian Empire and the death of its deposed ruler Charles the Fat. Unlike the end of the Carolingian Empire, however, the end of the Carolingian Renaissance cannot be precisely dated, and it was the latter development that was responsible for the "lack of writers" that Baronius, as a historian, found so irksome. ^ Schaff, Philip (1882). History of the Christian Church, Vol. IV: Mediaeval Christianity, A.D. 570–1073, Ch. XIII, §138. "Prevailing Ignorance in the Western Church"
^ Baronius, Caesar (1602). Annales Ecclesiastici, Vol. X. Roma, p. 647. "Novum incohatur saeculum quod, sua asperitate ac boni sterilitate ferreum, malique exudantis deformitate plumbeum, atque inopia scriptorum, appellari consuevit obscurum." ^ Burnet, Gilbert (1679). The History of the Reformation of the Church of England, Vol. I. Oxford, 1929, p. ii. ^ Burnet, Gilbert (1682). The History of the Reformation of the Church of England, Vol. II. Oxford, 1829, p. 423. Burnet also uses the term in 1682 in The Abridgement of the History of the Reformation of the Church of England (2nd Edition, London, 1683, p. 52) and in 1687 in Travels through France, Italy, Germany and Switzerland (London, 1750, p. 257). The Oxford English Dictionary erroneously cites the last of these as the earliest recorded use of the term in English. ^ Bartlett, Robert (2001). "Introduction: Perspectives on the Medieval World", in Medieval Panorama. ISBN 0-89236-642-7. "Disdain about the medieval past was especially forthright amongst the critical and rationalist thinkers of the Enlightenment. For them the Middle Ages epitomized the barbaric, priest-ridden world they were attempting to transform." ^ Gibbon, Edward (1788). The History of the Decline and Fall of the Roman Empire, Vol. 6, Ch. XXXVII, paragraph 619. ^ Alexander, Michael (2007). Medievalism: The Middle Ages in Modern England. Yale University Press. ^ Chandler, Alice K. (1971). A Dream of Order: The Medieval Ideal in Nineteenth-Century English Literature. University of Nebraska Press, p. 4. ^ Barber, John (2008). The Road from Eden: Studies in Christianity and Culture. Palo Alto, CA: Academica Press, p. 148, fn 3. ^ Hay, Denys (1977). Annalists and Historians. London: Methuen, p. 50. ^ Dunphy, Graeme (2007). "Literary Transitions, 1300–1500: From Late Mediaeval to Early Modern" in: The Camden House History of German Literature vol IV: "Early Modern German Literature". The chapter opens: "A popular if uninformed manner of speaking refers to the medieval period as "the dark ages." If there is a dark age in the literary history of Germany, however, it is the one that follows: the fourteenth and early fifteenth centuries, the time between the Middle High German Blütezeit and the full blossoming of the Renaissance. It may be called a dark age, not because literary production waned in these decades, but because nineteenth-century aesthetics and twentieth-century university curricula allowed the achievements of that time to fade into obscurity." ^ 'Digital Dark Age' May Doom Some Data, Science Daily, October 29, 2008. ^ Lemerle, Paul (1986). Byzantine Humanism, translated by Helen Lindsay and Ann Moffat. Canberra, pp. 81–82. ^ Whitby, Michael (1992). "Greek historical writing after Procopius" in Byzantine and Early Islamic Near East, ed. Averil Cameron and Lawrence I. Conrad, Princeton, pp. 25–80. ^ Lemerle, Paul (1986). Byzantine Humanism, translated by Helen Lindsay and Ann Moffat. Canberra, p. 81-84. ^ Cannon, John and Griffiths, Ralph (2000). The Oxford Illustrated History of the British Monarchy (Oxford Illustrated Histories), 2nd Revised edition. Oxford, England: Oxford University Press, p. 1. The first chapter opens with the sentence: "In the darkest of the Dark Ages, the fifth and sixth centuries, there were many kings in Britain but no kingdoms." ^ Encyclopædia Britannica "It is now rarely used by historians because of the value judgment it implies. Though sometimes taken to derive its meaning from the fact that little was then known about the period, the term's more usual and pejorative sense is of a period of intellectual darkness and barbarity." ^ Kyle Harper (2017). The Fate of Rome: Climate, Disease, and the End of an Empire (The Princeton History of the Ancient World). Princeton University Press. p. 12. These used to be called the Dark Ages. That label is best set aside. It is hopelessly redolent of Renaissance and Enlightenment prejudices. It altogether underestimates the impressive cultural vitality and enduring spiritual legacy of the entire period that has come to be known as "late antiquity". At the same time we do not have to euphemize the realities of imperial disintegration, economic collapse and societal disintegration. ^ Edward Grant. God and Reason in the Middle Ages, Cambridge 2001, p. 9. ^ quoted in the essay of Ted Peters about Science and Religion at "Lindsay Jones (editor in chief). Encyclopedia of Religion, Second Edition. Thomson Gale. 2005. p.8182"
^ Lindberg, D. (1992) The Beginnings of Western Science Chicago. University of Chicago Press. p.204. ^ a b Russell, Jeffey Burton (1991). Inventing the Flat Earth—Columbus and Modern Historians. Westport, CT: Praeger. pp. 49–58. ISBN 0-275-95904-X. ^ Lindberg, David C.; Numbers, Ronald L. (1986). "Beyond War and Peace: A Reappraisal of the Encounter between Christianity and Science". Church History. Cambridge University Press. 55 (3): 338–354. doi:10.2307/3166822. JSTOR 3166822. ^ Ronald Numbers (Lecturer) (May 11, 2006). Myths and Truths in Science and Religion: A historical perspective (Video Lecture). University of Cambridge (Howard Building, Downing College): The Faraday Institute for Science and Religion. Alban Gautier, « De l'usage des Dark Ages en histoire médiévale », portail Ménestrel, 2017.